Residing on the Pacific coast, it’s easy for me to see how Latinos continue to play key roles on some of baseball’s best teams. Valuable position players like Adrian Gonzalez, Yasiel Puig and Hanley Ramirez are a major reason why the Los Angeles Dodgers continue to hover near the top of the National League West. In contrast, the San Francisco Giants have scuffled ever since the injury of their lead-off pest, Angel Pagan, and he’s not expected back for a few more weeks. But after a slow start, Pablo Sandoval is starting to heat up, and the Panda has Bruce Bochy’s club back in business. In the American League, Yeonis Cespedes is enjoying his best season yet with the high-flying Oakland A’s. Cespedes is older and wiser than his Cuban countryman Puig, while proving to be at least his equal in all facets of the game. Meanwhile in Anaheim, a now healthy Albert Pujols has the Los Angeles Angels back in contention. And it’s hard to overlook the impact Robinson Cano has had on the Seattle Mariners, a team that is knocking on the door in the Wild Card race. In other parts of the country, Hispanic stars also dominate the landscape. The Baltimore Orioles “rented” Nelson Cruz this season and are currently the frontrunners in the AL East. Although Ryan Braun has has been both hot and cold, the Milwaukee Brewers are still in the NL Central hunt, thanks to Carlos Gomez and Aramis Ramirez. The Detroit Tigers employ baseball’s best hitter in Miguel Cabrera, but with an injury-free Victor Martinez having an excellent year, opposing pitchers are now forced to pick their poison when facing the AL Central leaders. I could go on and on, but I think you get my point. With that in mind, front office personnel from teams in both leagues are now accessing their needs for the dog days of summer and the stretch run. The non-waiver trade deadline is fast approaching, so here’s my list of 10 Latino players from selling or rebuilding clubs who might be on the move. 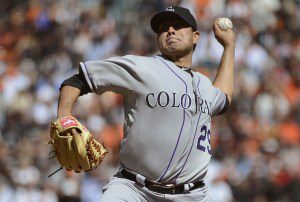 Jorge De La Rosa — The Colorado Rockies cagey southpaw is probably the best starting pitcher available, bouncing back nicely from Tommy John surgery. Although money might be an issue, I wouldn’t be surprised to see De La Rosa join former teammate Ubaldo Jimenez in Baltimore. The New York Yankees are also in desperate need of pitching help, and the Pittsburgh Pirates could also have an outside shot at the Mexican’s services. Bartolo Colon — The fact that the 41 year old Dominican is even mentioned here attests to the lack of rotation guys who might be on the trade block. But the veteran right hander can still get hitters out and could help a contending team get to the finish line. 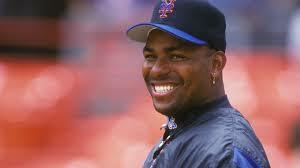 Colon’s current employer, the New York Mets, are playing well. But with excellent young players like Juan Lagares just scratching the surface, the Queens residents are better served to build for the future. Joakim Soria — The Texas Rangers don’t need a closer if they aren’t in the position to win games, and the Detroit Tigers bullpen is a mess. Soria gives Tigers manager Brad Ausmus a lot of options, and a deal is reportedly next to done. The irony is that the Mexican set up games for Joe Nathan in Texas last year, and now the roles might be reversed. Nathan, however, will still be making a lot more money. Oliver Perez — Every good team needs a lefty specialist out of the pen, and Perez is that type of pitcher. In 39 appearances with the Arizona Diamondbacks this season, he has notched an equal amount of strikeouts while compiling a 2.06 ERA. The 12 year veteran is still only 32, and signed a two year deal prior to spring training for $4.25 million. That’s not all that extravagant, except that the D-Backs have been a disaster and could be looking to dump excess salary. Adrian Beltre — An aging but still dangerous offensive weapon, Beltre would certainly solve the New York Yankees production problems at third base. The Texas Rangers motivation would be purely financial, since the Dominican veteran is guaranteed $35 million through 2015. That’s a contract tough for any team to absorb, so expect only the high rollers to bid for Beltre’s services. Emilio Bonifacio — There’s a reason why the 29 year old Dominican has played for six organizations in eight big league seasons, and it’s not because he doesn’t shower before boarding the team bus. Bonifacio, currently with the Chicago Cubs and recovering from a strained oblique muscle, is a versatile jack of all trades. He can play six defensive positions, hit with some gap power, and steals bases with regularity. What’s more, Bonifacio is clutch off the bench and only makes $2.5 million. So, with the Cubs going nowhere again this season, expect them to hold out for the best haul of young talent. Asdrubal Cabrera — The Cleveland Indians shortstop continues to be floated on the market because he’s in the final year of his deal, and will command a lot more than the $10 million he is banking this season. The Seattle Mariners are very interested and feel they can resign Cabrera, a decent offensive player, with Robinson Cano as a double play partner. The San Francisco Giants would also like to grab Cabrera, but use him as a second baseman to replace aging and ailing Marco Scutaro. Martin Prado — If the Beltre pursuit fails, which is likely, the Yankees would also love a guy like Prado. The Venezuelan can play third and second, possesses good offensive skills and is the ultimate team player. He also has a manageable contract through 2016. The problem is Prado’s employer, the Diamondbacks, who would be looking for pitching, pitching and more pitching. And that is a commodity that can’t be spared in the Bronx. Alex Rios — The 33-year-old slugger who has occasional mood swings has played well for his Texas Rangers club, but it’s unlikely that they will pick up his $13.5 million option for next season. Rios is a power guy with other tools that might be of interest to the Toronto Blue Jays, and the Cleveland Indians could use a right handed stick in the outfield. That would depend, of course, on whether the Tribe decides that they are genuine buyers. Dayan Viciedo — The “Cuban tank” has been disappointing for the Chicago White Sox thus far, and the team certainly doesn’t look like they’ll make a second half surge. They also have a surplus of outfield talent and Viciedo’s power bat is attractive bait. That said, the burly left fielder has pressed a bit in the shadow of Jose Abreu, and a change of scenery might be a positive move. The Mariners have been “kicking the tires,” and I think Viciedo would be happy there. There’s probably a dozen other players who could be cleaning out their lockers if the right deal presents itself. I don’t have a crystal ball and I’m not privy to any inside scoops. What I do know, though, is that there is plenty of Spanish-speaking athletes out there who let their God-given abilities do the talking. And at this critical point of the season, the wheeling and dealing between MLB team executives can get very interesting.